Hello and welcome to Tag Tuesday. For my second installment, I thought a fall theme. Although the temperatures here lately make me think of winter. I used a digi from The Paper Shelter and colored her up with my Copics. I bought this image because it reminded me of my love hate relationship with fall. I am a big fan of the fall on the east coast. I love the crisp air and smell of wood burning and am still in awe of the vibrant colors when the leaves change. The relationship typically sours when the leaves start to fall. Because then I am faced with raking and bagging them. So this year, I got on board and we have hired someone to do this for us so we can use those hours doing something we enjoy and my back is also grateful. 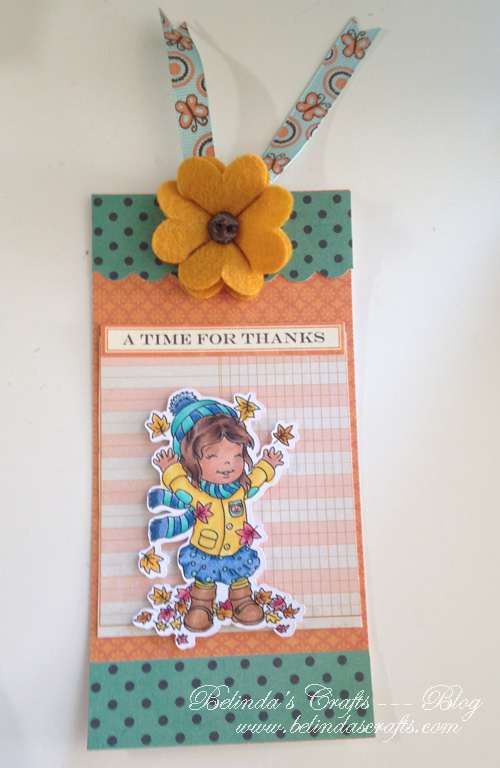 I used Crate Paper ‘Farmhouse for the paper on this tag. The deep rich colors make me happy. I pulled a coordinating ribbon out of my stash and then topped it with this fun wool-like flower from Recollections. For the words I used a Jillibean Soup label from my Project Life stash. I hope you are having a great day. Today is election day and I will be heading out to vote this morning with my boys and then treating them to the movies. This is just so cute! It screams Fall!